Months before 84-year-old Utah senator Orrin Hatch announced his retirement, polls showed Mitt Romney easily winning the race to replace him. When Romney received Hatch’s blessing to enter the contest, and quickly secured an endorsement from President Trump, he had every reason to think that he’d sail to victory. But that’s not how things work for Willard Mitt Romney. Romney was narrowly defeated at Saturday’s Republican state convention, receiving 49 percent of the vote to state Representative Mike Kennedy’s 51 percent. That means he’ll have to face a primary race, like some pleb who wasn’t governor of Massachusetts and the 2012 Republican presidential nominee, with a car elevator to boot. While this is a setback, Romney is still very likely to win the Senate race in November. He’d already qualified for the June 26 primary ballot by collecting more than 28,000 signatures — which Romney pointed to as the reason for his second-place finish. As the Salt Lake Tribune reports, for the past few years Utah conservatives have been fighting to overturn the law that allows signature gathering, since it weakens the power of the state convention. Convention delegates tend to be more conservative than the general Utah Republican electorate, and Romney would not be the first candidate to lose there but win the primary. In 2016 current Utah governor Gary Herbert lost at the convention and went on to easily win reelection. But the oddities of Utah state politics may not be the only reason that Romney fell short. 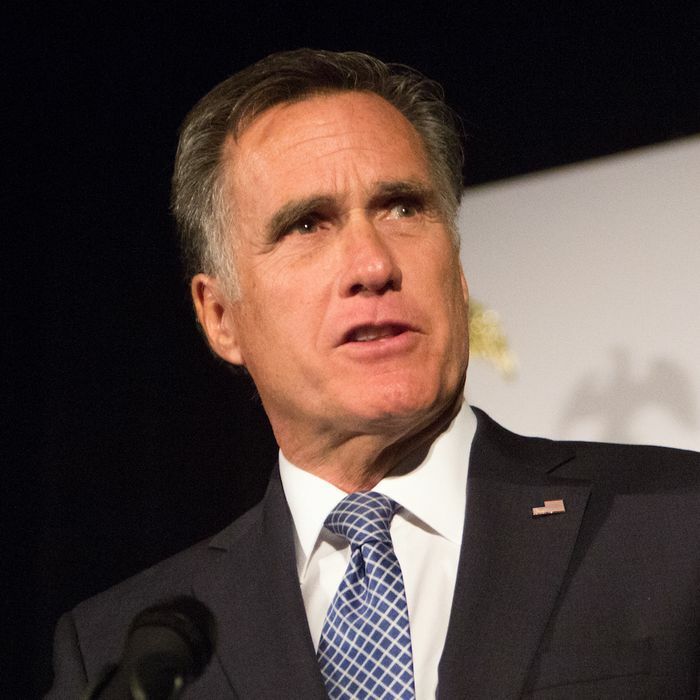 Kennedy and the ten other candidates Romney faced at the convention questioned the depth of his ties to Utah, and his shifting stance on Trump. While Romney was one of the most prominent Never Trumpers during the 2016 election, he then publicly auditioned to be Trump’s secretary of State. Though he occasionally criticized Trump during his first year in office, in recent months he’s toned down his remarks in an attempt to win over conservative Utahns. Romney offered a characteristically awkward retort, correcting Kennedy on his Biblical metaphor and claiming he’s the one who’ll take on the status quo in D.C. “First, none of us is David. David was anointed of God. And secondly, I’m not Goliath. Washington, D.C., is the Goliath,” he said. This primary battle might be a long two months.